As an Orthodontist in Bakersfield, CA, I treat a lot of children and teens. It always pains me to see kids walk into Gianquinto OrthoArts with serious problems requiring extensive treatment, when I know those issues could have been prevented or treated much more easily if they’d come in earlier. Detecting problems early can prevent a lot of pain and discomfort in the long run. It could mean the difference between getting easy, inexpensive treatment now, and needing much more serious treatment later – possibly even tooth extractions or surgery! That’s why the American Association of Orthodontics, the American Dental Association, and the American Association of Pediatric Dentistry all recommend getting a first evaluation at age 7. It’s about the age that permanent teeth should start coming in and replacing baby teeth. An orthodontist can make sure the adult teeth come in properly and preemptively solve many problems with eruption. 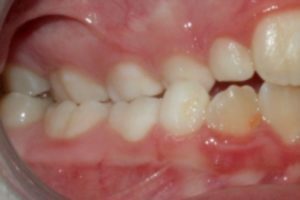 Dental problems develop slowly as a child’s teeth develop, and it’s much easier to address problems early or prevent them entirely, rather than allow them to grow into more serious ones. A child’s teeth and jaws are more malleable and respond better to treatment because they are still growing. When you take your child in for an Early Evaluation, it gives me the opportunity to detect the potential for a poor bite position, crooked teeth, and jaw abnormalities – and nip these problems in the bud early. That might mean your child won’t need to wear braces for as long – or it could prevent the need for braces entirely. By having us monitor and correct your child’s teeth as they’re developing, you’ll ensure that they can develop a beautiful, healthy smile with the gentlest treatment possible. Crowded teeth: This is when teeth are turned or are beginning to overlap. This can also lead to tooth decay or even tooth loss because the teeth can be very tough to clean. Protrusive teeth: Aka “buck teeth”. When the front teeth are protruding too far forward, they are highly prone to damage. Crossbite: All of the top teeth should close in front of the bottom teeth. When one or more of the top teeth come down behind of the bottom teeth, that’s a crossbite. We can treat that with simple appliances – if we detect it early enough. Openbite: This is when there is an open space between the top and bottom teeth, even when your mouth is fully closed. The teeth aren’t aligned to allow all the teeth to come together at the same time. This can cause you to wear down the teeth that do come together, which will eventually require additional treatment to restore the teeth. 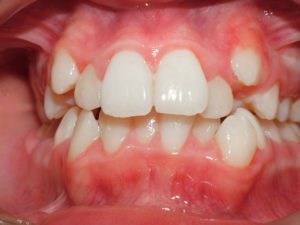 Deep Bite: This is when the upper teeth overlap the lower teeth too much. Sometimes the lower teeth touch the roof of the mouth, which will cause tissue damage and possible tooth loss if not corrected. Habits: Thumb, finger and/or lip sucking can cause serious problems if they are not addressed before the permanent teeth start coming in. The sooner the habit is broken, the better the chance that the teeth will correct on their own. We can help! Psychosocial Concerns: Many kids are bullied because of the appearance of their teeth. While there might not be an orthodontic reason for early straightening of teeth, a nice smile can make life at school much easier. Even if your child doesn’t seem to have any of these problems, we still recommend they have an Early Evaluation at age 7. These problems can often go undetected while they’re still developing – and that’s exactly when they’re easiest to treat. At Gianquinto OrthoArts, we offer free Early Evaluations to identify these problems for you, so you can at least be informed of what’s happening with your child’s teeth. Odds are that no treatment will be necessary. But if your child DOES need treatment, you can find that out for free and save pain, discomfort and money in the long run by correcting problems while they’re still small. It can be tempting to assume that if your child’s teeth look straight, it’s safe to skip the trip to the orthodontist. Don’t skip it! Your child will thank you later. If you’re ready to schedule a complimentary Early Evaluation for your child, you can call us at 661-829-7970, or click the button below and fill out our Consultation Request form. Our staff will quickly reach out to you to schedule your appointment.